Simple ingredients make a colourful and hearty meal. Ditali noodles are short hollow tubes, but as pictured here I used tricolor brown rice spirals, with garlic toasts on the side. Take the head of garlic and chop the top off. Brush with olive oil and wrap in aluminum foil. Toss red pepper with olive oil, and place in the oven along with the garlic. Roast at 450F for 30 minutes. Meanwhile, prepare a side dish of your choice, such as garlic toasts, bruschetta, or a big green salad. Also, bring a large pot of salted water to boil. Add pasta and cook until al dente. Drain. When red peppers are roasted, place in a blender along with chickpeas, tahini, olive oil, lemon juice and salt. Scoop out the soft flesh of the garlic head and add to the blender. Puree until smooth (add some water to get it blending -- pasta cooking water works best). 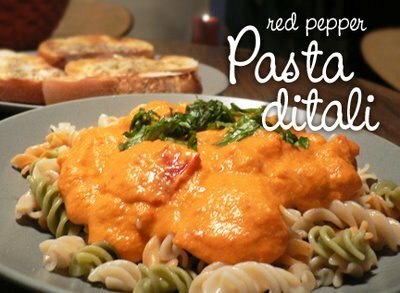 For a chunkier sauce, reserve some of the roasted red pepper and chick peas, and stir back into the sauce after blended. Ladle noodles onto serving dishes and spoon sauce on top. Garnish with something nice, like chopped fresh basil, chili flakes, or slivered almonds. Serves 4. VATAS you're best to avoid peppers and chickpeas so this dish is not very Vata-friendly... but why not try this using oven-roasted pumpkin and beets instead! after roasting the head of garlic, do you use the whole thing? isn't that a LOT of garlic? ?